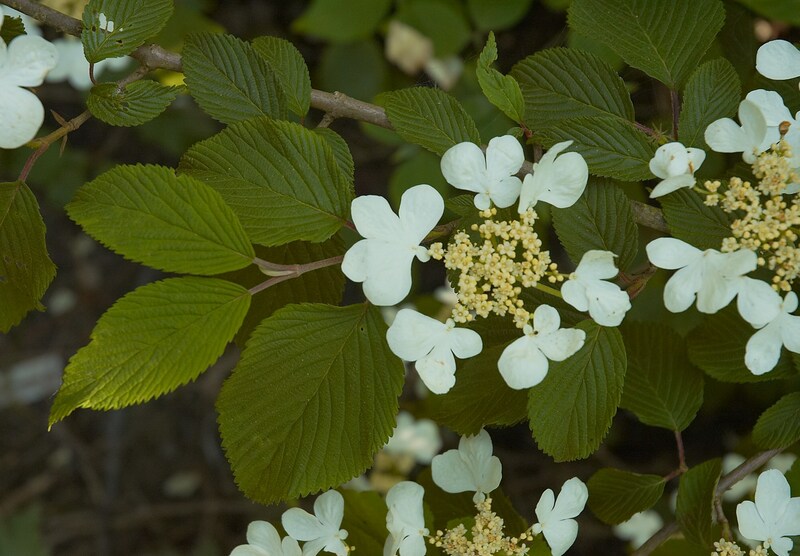 Viburnum plicatum. Mariesii.B.commons.wikipedia.org. (Accessed 6/2014). Viburnum plicatum is a shrub to 3 m tall, new growth hairy, old bark gray-brown with tiny orange dots (lenticels). Leaves opposite to 10 cm long, to 8 cm wide, broadly egg-shaped to rounded, tip abruptly pointed, base rounded to slightly lobed, underside with cushions of tiny hairs (stellate-pubescent), (use lens), secondary veins numerous, evenly spaced, parallel, sharply impressed above; margin evenly, coarsely toothed, stalks hairy, to 2.5 cm, winter buds naked, leaf-like, hairy. Flowers white, in seven-rayed umbrella-shaped clusters, on short, opposite branches, marginal flowers sterile, showy, bilaterally symmetric, ca 2.5 cm wide, central flowers small, fertile, radially symmetric. Fruit fleshy, red, turning black when ripe, ca 0.8 cm wide, 1-seeded, bird-dispersed. Habitat: Understory shrub in rich, moist to wet soil. Either a remnant horticultural planting or occasionally escapee. Apparently shade tolerant.